So let’s say you’ve booked an amazing camping getaway with a viator promo code and you’re super-excited to go. But then you realize: how can I go be enviro-friendly while using gas stoves, lighting campfires and taking showers powered by a camper? When you are at home you strive to use energy-efficient appliances, but you can’t exactly bring those with you! Environmental-conscious camping is growing more amongst outdoor enthusiasts and avid campers. Solar-powered camping gear provides a healthier and more responsible way to enjoy the outdoors without harming our environment. There is a growing surge of companies who are creating equipment that run on solar energy, and they are helping many individuals and communities around the globe in the process. Goal Zero is a company that got its start helping impoverished communities in the Democratic Republic of the Congo. In 2007 and 2008, Goal Zero started creating solar-powered panels and batteries that brought self-sustainability and necessary energy to impoverished communities in the Congo. Their mission has only grown, and now Goal Zero offers an array of solar-powered audio accessories, lighting systems/lanterns, batteries, and generators. A solar panel or solar-powered multi-purpose battery is the first step to Green camping, and Goal Zero is the company for the necessary solar panel. Food. It’s essential everyday, and it’s one of the challenges campers have to really consider and plan for. How one cooks their food on a camping excursion requires time, energy, and focus, but how does one cook on a camping trip without burning coal? There’s a company out of Australia who has come up with a better solution to this dilemma, and they are GoSun Stoves. Portable and solar-fueled, GoSun stoves are the easiest outdoor cookers to carry, implement, and clean. Their stoves reach temperatures as high as 550°F, which means you can cook up just about any meal. GoSun Stoves is a charitable company partnered with Trees for the Future, and under this partnership and for every GoSun stove sold, the company plants 20 new trees in Kenya, Cameroon, Senegal, Tanzania, and Uganda. The luxury of warm water is usually cut off once you embark into the woods and pitch up camp. If you’re someone who can’t bathe in cold water for longer than 10 seconds, you’re probably going to smell after a couple of days without a shower. With the Coleman 5-Gallon Solar Shower, you no longer have to go days without a shower! The Coleman 5-Gallon Solar Shower is a sturdy bag that heats up water using solar energy, and it easily connects to most RV shower heads. No RV? No problem! After all, this is Green camping. 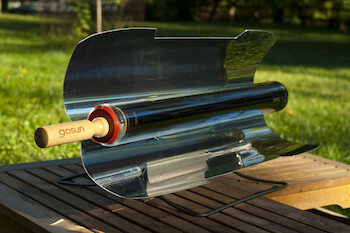 The Coleman 5-Gallon Solar Shower is handheld, too. It’s available on Amazon.com for $14.95, and it’s a very small investment to get warm water without burning fuel. Clean, chemical-free water is hard to come by in many areas around the world. But Puralytics, an award-winning company based out of Oregon, is combatting this and empowering communities who lack clean, drinkable and usable water. Puralytics SolarBag® breaks down pesticides, petrochemicals, metal, and other chemicals found in water. It also sterilizes illness-causing pathogens using LED lighting. Their water purifiers are reusable and go through a simple, patented photochemical process: just keep water enclosed in the purifier under the sun, and in a few hours, the water can be used and drank. Puralytics SolarBag® not only creates drinkable and usable water for campers, but also for the developing world and in regions devastated by natural disasters. The SolarBag® is used around the world, and you can learn more about these amazing solar-powered water bags here. Now it is possible to keep food and drinks fresh and cold with the Solar-Cooler. The Solar-Cooler collects energy from the sun and distributes the energy into the solar-battery powered system. The Solar-Cooler keeps food and drinks cool at 42°F. The cooler also acts as a charger for electronic devices by transporting the energy collected by its solar panel into its outlet. According to SolarCool Technologies, its Solar-Cooler “offsets 5,000 pounds” of carbon emissions. This solar-powered cooler has received great reviews from Golf Digest, Popular Science, and Newsday, and it is produced by a company that is constantly working up new ways to use renewable solar, wind and hydrogen energy. No more fuel on your camping trips! What is the need for fuel and coal when you can invest in solar-powered camping gear? It’s the healthier way to camp, and it’s not only helping our climate in the meantime, but also communities around the world!